Santa Monica Air Line—Why use ovals to run a railroad? A Word to the Wyes—Oval switchyard with reversing! 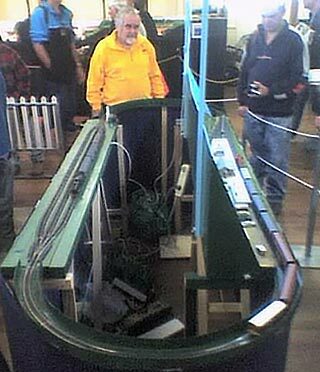 “Part-Time Ovals” is a new name for a well-known idea… they are circuits of track that can temporarily be attached to a model layout whenever you need a continuous run—at a train show or showing off at home or whatever. We featured some variations on this idea in our “Masters Class” edition a few months ago. That page encouraged readers to send their ideas and memories, and here are a bunch of them that may provide some inspiration for you. We explored some of what John is talking about in Scrapbook #97a. It seems to me to be a particularly sneaky way to turn a bunch of good, small layouts into a big monster mash, but a number of people are exploring ingenious ways to use this idea. So here are some of their approaches that might stimulate your imagination. If one does, please tell us about it! Here’s a good example of what this page is about. 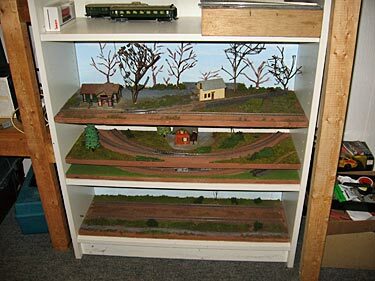 This layout, which is stored in an IKEA Billy bookshelf unit, consists of four Island Layouts that can be joined—by pieces of Märklin C sectional track—to form a Part-Time Oval (continuous) layout. Andreas Nesemann, from Newark, Delaware, USA, built each segment on 3/4in (2cm) plywood cut exactly the same size as the IKEA shelves: 760x252mm (30×10¼in). Note: Andreas adds, “Each layout board has little foam strips (weather stripping) underneath, so the full layout can be set up on my dining room table without scratching the surface.” A thoughtful addition! In response to our article about micro-modules in Scrapbook #97a, Charles Hansen, from Boston, Massachusetts, USA sent us the above three antique photos, taken in the early 1950s, with the following charming commentary. 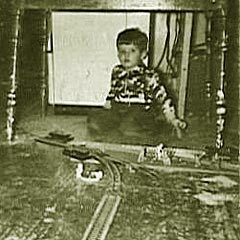 “My parents gave my brother and me American Flyer trains, and very quickly my father created modules on plywood so there wouldn’t be so much track to connect when we set up each time. 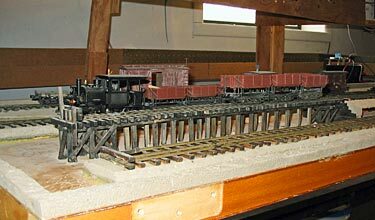 This included long straight and curved sections as well as more complex trackwork with switches. 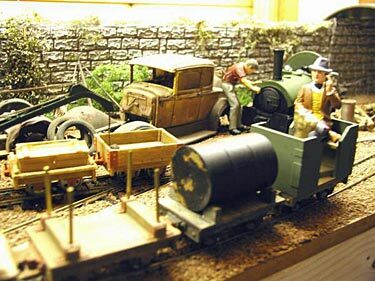 Unlike James’ modules, figures and scenery were added each time, so this also varied. As with the situation shown on your site, this did give us flexibility in layout design, but no doubt we had favorites to fit the lower east side Manhattan apartment we lived in at the time. [Ed. 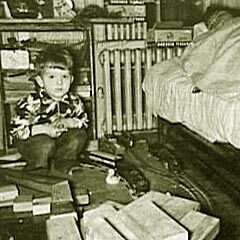 Note: A number of other readers also sent me reminiscences of their childhood trains that included modules of track permanantly mounted on plywood, either to make it easier for young hands to assemble layouts or to encourage experimenting in flexible layout design. Charles is unique because he still retains photographic evidence! While Mike is basing his design on his own railfanning experiences of a few years back (plus a detailed treatise in the 3rd quarter ’95 Milwaukee Railroader), most of us know about the Kingsbury Branch from an excellent Model Railroader magazine article in April 1975, and from Bill Denton’s admirable N-scale layout depicting the branch. 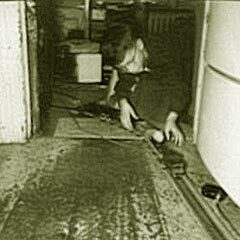 Bill’s website tells more about the prototype and has lots of model photos as well. Here’s another Part-Time Oval from the state of Colorado, USA. 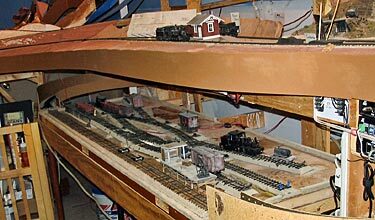 Tim Bristow’s basement in Pagosa Springs is filled with an Sn3 layout that runs around the walls with its main yard on a central peninsula. 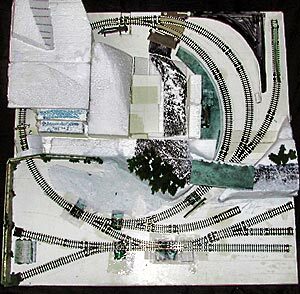 When Tim wanted to experiment with a small layout featuring On30 trains, where was the obvious place to put it? Under the peninsula, of course! The result you see here is Tim’s Piedra Railway. THIS ‘PART-TIME’ OVAL IS PERMANENTLY ATTACHED! 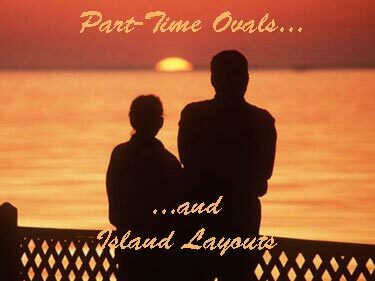 When it comes to ovals, “part-time” can be a state of mind as well as of location. A good example is found in Terry Allen’s 4x1ft (120x30cm) layout, Nuffin Works. 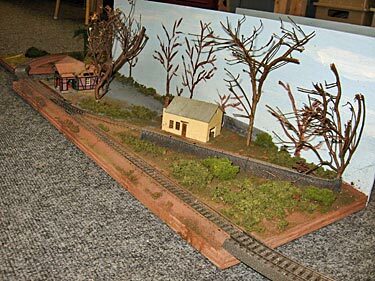 Terry, who lives in Bridgwater, Somerset, England, was an early worker in Gn15 scale and built the layout to show off this type of minimum-gauge railway. There’s an oval there all right, mostly hidden behind the backscene, but it’s not principally for round-and-round running (except at exhibitions, of course). 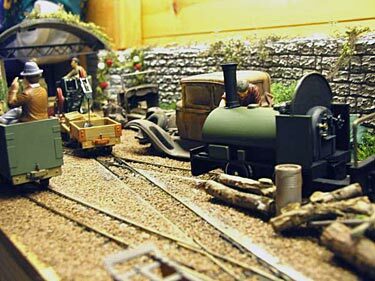 Instead its job is to hold trains before they enter the scene, to permit “run-around” moves as needed, and to provide an entrance point for Terry’s varied (and well-used) rolling stock, some of which is shown here. Significant other uses for the oval might include running-in locomotives and providing run-bys to please children. Main use is to facilitate switching. 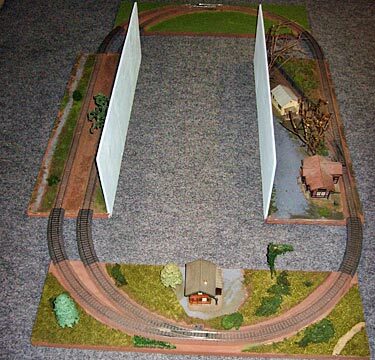 John Bruce, from Los Angeles, California, USA, has also been thinking about oval layouts for small spaces. He’s designed one that gives weight both to oval operations and switching activities. It’s Santa Monica Air Line, measuring 60x42in (150x105cm). John explains, “I am thinking of a prototype based on California interurbans converted to diesel freight lines. The Air Line is based on an ex-Pacific Electric line in my area, but it could as easily be the Central California Traction, Sacramento Northern, or Tidewater Southern. The interurban theme justifies sharp curves and more or less modern diesel freight. 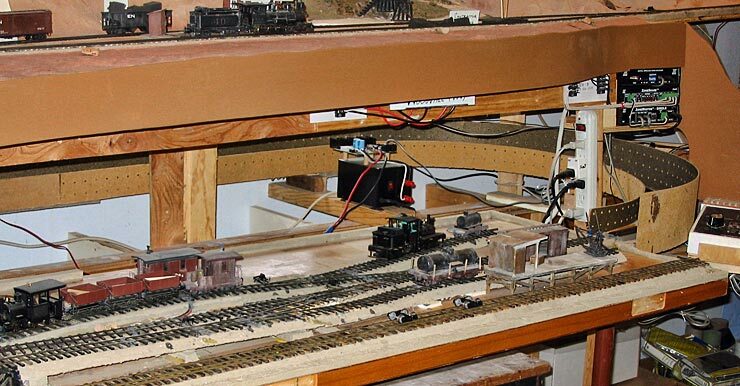 John recognizes the switching benefits of integral ovals, and adds a couple more plusses: “Another use of the oval is to ‘add mileage,’ which has been fairly well discussed [in the past, as a way of making two stations seem farther apart by requiring several laps of the layout to get from one to the other]. But also, and I found this on a small HOe layout that I built 25 years ago, the oval provides a runaround option. Combined, they allow you to run 2 or 3 units on a freight and still get some kind of interesting switching operation on such a small layout. 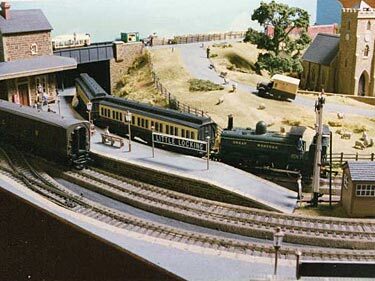 A popular option in #98 was Circlinglenook, modeled on the tiny train ferry yards that lined New York City rivers. Many readers liked the idea of using the oval as a head shunt (switching lead), as well as for train running. One thought for adding to that flexibility is to add a “turnaround runaround,” a wye (triangle) track formation that allows a switcher both to run around a car and to reverse the direction it’s facing. Space cost is about two feet of extra length. But flexibility of added operation may be priceless! OVAL YARD LEADS CAN LEAD YOU QUITE A LONG WAY! 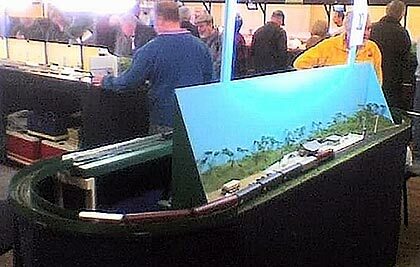 Finally, to demonstrate that this is not exactly a new train of thought (so to speak), here’s a British layout from the 1990s exhibition circuit, built and displayed by Dave Howsam, from Manchester, England. 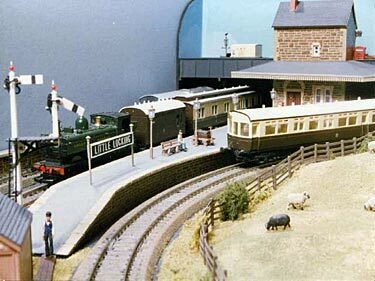 Little Locking slyly integrates an oval into a tightly packed GWR branch terminal line.